Donald Tusk, the Elected President of the European Council has rubbed salt into the wounds of Theresa May’s Brexit humiliation in Salzburg by mocking her negotiating strategy on Instagram. 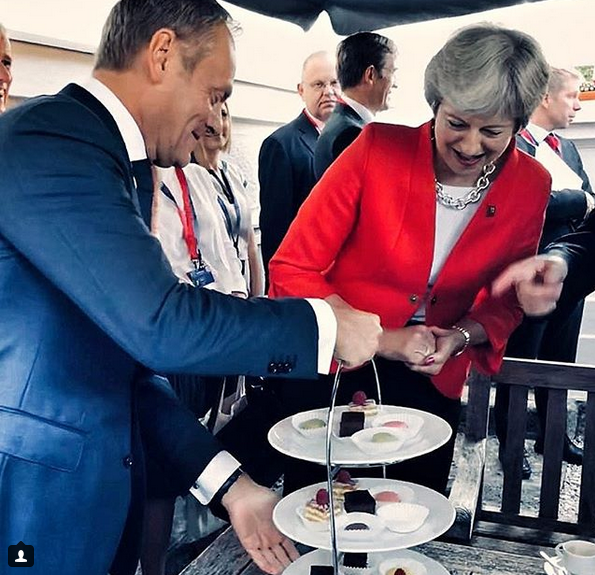 During the summit Donald Tusk ushered the Prime Minister over to a strategically positioned tray of cakes and offered her a morsel to eat. A piece of cake, perhaps? Sorry, no cherries. The rinsing is a reference to a running joke in Brussels that Britain wants to “have its cake and eat it” in talks. The UK has also been accused of “cherrypicking” because it wants to stay in the parts of the single market it likes but not the parts it doesn’t like.